The moisture (or total solids) content of foods is important to food manufacturers for a variety of reasons. Moisture is an important factor in food quality, preservation, and resistance to deterioration. Determination of moisture content also is necessary to calculate the content of other food constituents on a uniform basis (i.e., dry weight basis). The dry matter that remains after moisture analysis is commonly referred to as total solids. While moisture content is not given on a nutrition label, it must be determined to calculate total carbohydrate content. Moisture content of foods can be determined by a variety of methods, but obtaining accurate and precise data is commonly a challenge. The various methods of analysis have different applications, advantages, and disadvantages (see Reading Assignment). If the ash content also is to be determined, it is often convenient to combine the moisture and ash determinations. In this experiment, several methods to determine the moisture content of foods will be used and the results compared. 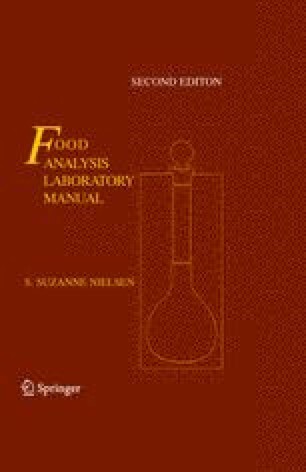 Summarized below are the food samples proposed for analysis and the methods used. However, note that other types of food samples could be analyzed and groups of students could analyze different types of food samples. It is recommended that all analyses be performed in triplicate, as time permits. This experiment was developed in part with materials provided by Dr Charles E. Carpenter, Department of Nutrition and Food Sciences, Utah State University, Logan UT, and by Dr Joseph Montecalvo, Jr., Department of Food Science and Nutrition, California Polytechnic State University, San Luis Obispo, CA. Arizona Instrument Corp., Tempe, AZ, is acknowledged for its partial contribution of a Computrac moisture analyzer for use in developing a section of this laboratory exercise.